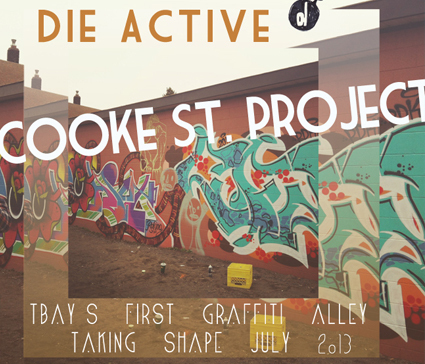 Beginning in July 2013 visit the alley-like Cooke Street, just behind Red River Road off of Court st, and see an Urban Art project unfold. Several Downtown businesses will participate in having their buildings adorned with art and graffiti by artists of the Die Active Art Collective. Watch your city transform with its first ever graffiti alley! A partnership with downtown north businesses.